If you want to let your whimsical side escape and aren’t quite sure how to start, Decorating with Funky Shui by Jennifer and Kitty O’Neil can give you the guidance you need. This book puts the "fun" in funky, with ideas such as decorating your yard with penguins instead of the standard pink flamingos. However, this book is not just a list of oddities. There is a method to the writers’ eccentricities. 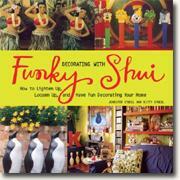 They have developed four principles of fun decorating, called the fun-damentals of funky shui. These authors apply the four principles of decorating to each room in the house, as well as the garden area. The book is divided into chapters featuring each room in the home. The first room discussed is the living room. While you may not want to display a fire hydrant in your living room, the authors’ idea of putting a fun conversation piece in a room that is traditionally boring and safe really has merit. As you move on to your kitchen, take a serious look at the advice mixed in with the lighthearted decorating tips. The authors’ suggestion for choosing wall color is quite helpful. Step into a dining room decorated with funky shui and you aren’t walking into just another boring place to eat. Don’t miss the playful chandeliers or the ideas for table centerpieces. Many more people are creating home offices. Instead of that standard, boring wood or metal desk, Funky Shui recommends using your imagination to make a one-of-a-kind desk that means something to you. For example, the authors use a surfboard for a desktop. The inventive ideas continue in the bedroom, bathroom, and guest room. Finally, Funky Shui takes on the yard. Children’s toys filled with flowers and inventive wind chimes are just a few of the innovative ideas in this chapter. If your house suffers from a fatal case of the blahs, this book will wake up your creative side. Even though the authors take their decorating ideas a bit further than the average person would be comfortable with, there are a lot of interesting ideas to help inspire someone who has no idea how to start having fun in a bland house. © 2004 by Katelyn Thomas for curledup.com.